Distributor: Currently licensed by Discotek Media, and also available streaming on Viewster. Notes: Released initially as thirteen, 24 minute, episodes followed by two 95 minute episodes to make a total of fifteen episodes. The original VHS were released over the space of three years. EDITORIAL NOTE: Though this is the chronologically second review written for the series (2012), this is the first complete series review written and therefore supplants the older, incomplete review by Carlos. Mima Tokiko doesn't even look like a regular 13-year-old. Pale, emotionless, with only the most distant of voices, she seems like a robot struggling to gain humanity. In fact, she is. From her creation, her doting "grandfather" has been helping her to grow, in body and spirit. But now he is gone, leaving only one cryptic clue: make 30,000 friends, and she will be truly human. What does this impossible-seeming task really mean? How does one make so many friends, especially when she is a lonely android unknowing of the human heart? What is her connection with the idol singer Utsuse Miho? And what is the real purpose of the one named "Key"? Experiments are exciting. Nameless machinery flickering, lightning strikes, mad cackling and that's just the animé studio before even anything remotely scientific has crossed the minds of the huddled pioneers ready to embark on their narrative adventure. The excitement is important since experiments are risky. I think all of us who have plumbed even the shallow end of the animé pool have come across a show, maybe just a single episode OVA, that could only be matched in experimentation by how badly it failed, its adventure only matched by its folly and the black hole it left in the pockets of its funders. It's mad to innovate, to push boundaries, but it's what artists do. Artists will always dream, always reach further than their audience may well be willing to go, but sometimes it works - sometimes there are dreams that make it to the screen and they pour out beautifully like fine paint rather than in graceless splodges. Key the Metal Idol is that beautiful dream. I suspect you don't know Hiroaki Sato. Don't worry, neither does Wikipedia. I certainly didn't. Aside from various work doing art or animation, the occasional script is all that exists of his work. I'm not even sure if I can find a picture of the man - he is not even the most famous Hiroaki Sato in Japan! Yet here we have his experiment. He wrote it, he directed it, it was his brainchild and he called it Key the Metal Idol. What experiment, you may ask? The first thing you will notice about this show is that it is not a television show: Fifteen episodes all originally found on VHS released back in the dark, distant Pre-Evangelion era of 1994 to the Pre-Lain era of 1997. Its very composition is bizarre, having thirteen normal episodes then two movie length closing episodes. The show also has a narrative split that consists of episodes one to seven being the 'First Program', eight to thirteen being the 'Second Program' and fourteen and fifteen being the 'Third Program' and the 'Final Program' respectively - and there is a very definite split in each of these 'arcs'. The narrative, itself, was an experiment, though one now less extraordinary. 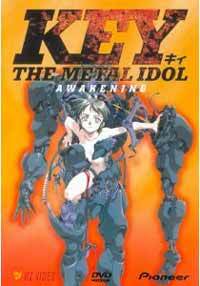 It may seem almost standard in the post-Eva, post-Lain animé world in which we live to reveal (or not reveal) the plot and the themes of your show only in hints and symbolism (even English speaking television has caught up on this) but Key the Metal Idol was one of the first. What is Key? Who are these villains? What, the heck, is going on? We only get the slightest hints of the answers and most of these only throw up new questions anyway. It was a show that wants to challenge and does so with an uncommon subtlety at its heart that remains unmatched by most of its successors, probably not even by the great shows that popularised these obscuring techniques. That all said the best experiments are simplest - complexity is a garnish. We have a girl who isn't a real girl but wants to be, we have a quest to find her humanity and we have a goal to reach: the robot can become human if she can touch the hearts of and befriend thirty thousand people. It is that simple. Of course, she has obstacles; she has challenges and missteps, but also friends and companions to help her and all the benefits and problems that come with them. In truth, it is hard to say where Key the Metal Idol is at its best. I sigh when I consider this show, like a lovelorn troubadour, but I will just start where everyone will have to start. Key the Metal Idol looks like a 90s animé. I do not say that as an insult but it is very hard to mistake its vintage when you see the animation, the character designs and even the dress sense of the characters. In fact, perhaps visually it is the epitome of the 90s: the angled faces, the men with upside-down pears for bodies and hairstyles that are needlessly spiky. It reminds me of watching Back to the Future and feeling slapped, aesthetically, in the face with a puffer jacket wearing tuna called the 80s - at least in the 'modern' scenes. As I said though, this is an observation and not a criticism. Many of us animé fans have a certain fondness for the 90s and one thing that is for sure is that Key the Metal Idol does not fall into the errors of many contemporaries. First of all, it is still a very polished and pretty show. Even though it is made by Studio Pierrot (not often noted for their exquisite sense of grace and beauty), the show manages to capture quite the atmosphere and aesthetic. It is not the art house beauty of a show like Serial Experiments Lain but the animation is smooth, the characters unique, detailed and appealing and the show rarely feels stale or static even through long periods of dialogue. The story itself is, as mentioned, simple but its delivery deep. The pacing is notable for not falling into too much unevenness (there is one criticism) and there is always enough mystery coupled with enough clues to keep the narrative interesting. The clues to the big questions arrive with the skill of a production that really knows what it wants: easy to miss visual cues, snippets of apparently meaningless dialogue and in everything in between. The depth reveals itself in what is not said as much as is; motives and explanations of events might only have an answer or even just a fair interpretation in the periphery of a conversation and this is storytelling and theme in its most elegant, intelligent and enticing form. Storytelling where even the most mundane thing can reap rewards with a little consideration - not in the cheap pseudo-intellectual way that shows such as Eva have wielded symbolism but in small, helpful ways that add too rather than rests awkwardly upon the compelling story. That leads me, however to the main criticism of perhaps the whole show. In episode fourteen, where the show does go to great lengths to fill in many of the gaps that it wants to fill before the, utterly incredible finale, things become a bit unstuck. Suddenly the information no longer comes in clues but in thick and fast exposition that shows a lack of cleverness and subtlety compared to the rest of the series and it is jarring. It is ultimately too plain and too simple, you learn what is well-crafted and entertaining information, but it is ultimately not as satisfying as if we had been trusted to piece it all together or if it had been better spread across the series, the former the superior option in my opinion. That said, episode fifteen is a true return to form and if it doesn't leave you with questions and doubts to chew over like some regal cud, then you weren't paying attention. The characters, too, are a work of art. Key, without a lick of emotion, is compelling and the way we see her world unfold through her is alien and beautiful. I noticed early on at how odd some of the character interactions around her were, characters acting out in ways where the motive for their actions seemed unclear. I was about to peg this down as a negative and a sign of poor writing but it suddenly struck me how perfect it was. The humans, even Key's friends, are alien to her - they are human and she is a robot - and for the audience to grasp her and her desires but not the humans around her is, to me, utterly fantastic. It is a small thing but it makes such a difference. The small character steps and progression that Ajo's employees make or the complexity of Ajo's relationship with Sergei, not explained just shown, are so minor but are the princeliest parts to a kingliest whole. Best of all, unlike large elements of the plot, many of these relationships and dynamics found amongst the characters that I do not have the time here to dissect or explore (I'll leave that to you) are never explained - only the interaction and its context in the story. Less is more and nothing proves that better than Key the Metal Idol's characters. Do I need to say more? This is animé history, a half-forgotten masterpiece by an all but forgotten man - if you want to know why those old time animé fans telling you about greatness of the 90s then this is one of the shows that will teach you. Not perfect by any means, it suffers from that clunky fourteenth episode and a sense of newness that it has long since lost in terms of narrative, but if you want your show to be dark, cerebral, meaningful, poignant and occasionally awe-inspiringly beautiful then I offer you Key the Metal Idol: enjoy. Recommended Audience: NOT for children. Disturbing sexual overtones and violence prove this is one for the mature teens and adults. However, the intelligent viewer can really get something out of this outsider's look at the human race that is truly worthwhile. Also very emotionally taxing, as well -- don't watch this on under five hours of sleep.